i recently bought a 2009 A4 premium Quattro with 102,000 miles. I absolutely love my car but I got burned by some bad mechanic work under the hood. Please excuse any verbiage I get incorrect. I'm a hands on type of guy but I've never gone this far into a motor like this so I'm completely ignorant. The check engine light came on and so I had it checked and it was a vacuum leak and it was about due for an oil Change so I made an appointment with the dealership to have the oil changed and leak checked and they were thinking the leak was coming from the oil separator or something like that and when they opened it up they found that the threads were completely stripped in every single place to seal it down from some work done by a dealership called McDonald audi in Denver, Colorado a couple years back. I'll send you the pictures so you can see cause they showed them to me. They said it's all one piece so they would have to replace the entire thing. I think it's called a crankcase. $3800 estimate. Extended Warranty won't cover because it's workmanship and not a mechanical breakdown, and I had already had the car too long for the dealer I got it from to hold any responsibility. My question is do you think there is anything else I can do for it? A friend of mine I asked mentioned maybe there was a way to somehow re thread them but he wasn't sure. Or with the right tools could I do that myself or is it just too complex? They've got 1700 in labor on there so if I had to pay and fix the whole thing it would be great to at least save that if I could do it myself. I do not want to get rid of my car because I love it but I'm not in a great position right now to throw down four grand. Any help or advice is much appreciated!! First problem is taking it to a mechanic. Instead, find a good, professional auto TECHNICIAN. Anyways, the stripped holes are real common. The bolts originally have Loc-Tite (thread locker) and they sometimes strip when removing the bolts for the first time. By your photo, I can see this is probably exactly what happened. Back when I was an Audi tech at a dealer (before I got smart and got the bleep out and went to an indy shop), repaired more than one of what you describe using the method below. What you need is a Heli-Coil kit or a thread insert kit (either style will work). Drill the holes using the bit that comes with the kit, then thread them using the tap in the kit and finally, the Heli-Coil or insert is threaded in resulting in a threaded hole the same size as original. For non-critical holes like the ones for the oil separator, this repair will work just fine and cost a whole bunch less than $3,800! I'd GUESS it'll be a couple hundred bucks for parts and labor. As I said, that's only a guess. You don't know how great that is to hear! Thank you very much! I apologize for the incorrect title, I meant technician as it was the audi technician at the dealership who did the work. I didn't realize it was such a common issue. The dealership here in Tulsa made it out to seem like a dumbass technician just destroyed it and the only possible way to repair it was to replace the entire block. I did come across the helicoils shortly after posting but I wasn't sure if they would be sufficient enough for that location and last. My last questions for you is do you know what size bolts they are in that location? Or where to find out without pulling it apart first? If not I'll just have to get in there and see for myself but from where I live and the shop the closest parts store is almost an hour away so finding a ride may prove to be difficult. Also is there any other parts, special tools or lube or anything I am going to need to complete this job? And is there any other parts That would have been affected by this vacuum leak I should be looking out for to make sure they are still good. This car is my baby so I want her back in tip top shape like she should be! I'm just looking for some friendly advice. I realize some of those questions may sound stupid but I like to try and cover all my bases before I start a project and always get second opinions as I have a very trusted technician that is going to do this with me but incase you guys know something he doesn't I ask anyway and all your help is very much appreciated!! What I meant was, there are "mechanics" and then there are technicians. I've worked with both kinds and am fortunate to work with 4 others at the shop that are technicians!We use the word mechanic to describe a parts hanger who doesn't know enough or care enough to diagnose and do the repair correctly and give all people that work on cars for a living a bad name. Despite what you see in the media, there are far more good than bad (as with any profession). Well, enough of that off topic, lol! Sorry, I don't know what size the bolts are off hand. I'd GUESS 6mm X 1.75 thread pitch but please don't quote me on that. I've not been an Audi tech for 2 years now and a lot of stuff has faded from the memory banks. There shouldn't be any other parts you need or any that were affected by a vacuum leak. That particular Audi engine is very critical for crankcase air leaks, more so than most cars it seems. Good luck and hope it turns out good. Never hesitate to ask questions. There is no such thing as a dumb question (well, actually there is but you know what I mean). Better to ask than guess and guess wrong. Yeah that makes perfect sense on the technician vs mechanic! It seems more and more common people only doing the minimum of what they have to instead of taking pride in their work and doing it right! Thanks a lot for your advice! I'll be getting into it tomorrow. I don't think I'll have any issues. I was wondering though I was researching some of the symptoms of some of the things my car has been doing such as rough idle, loss of power, whistle noise during acceleration and all signs point to the pcv valve and since I'll be right there tomorrow I figured I'd take a look at it. What I don't know though is how to tell weather or not the valve is bad? What are the signs? What should I be looking for to let me know if it needs to be replaced or not? I hear you on people doing only the minimum. As I said though, there's more that do take pride in their work than those that don't. Problem is, the only ones you hear about are the latter. Kind of like "kids". The majority are good, polite, have a good work ethic, are responsible, etc but the only ones you hear about are the teens that cause trouble. Depending on how much you want to spend, a new PCV/Oil separator assy isn't too bad. I see Rock Auto has them for about $87. 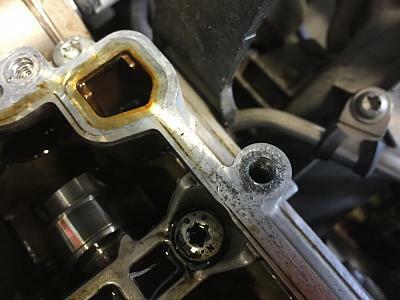 However, all the problems you mentioned can be caused by the seal under the valve leaking because of the stripped bolt holes. It will cause a rough idle, whistling, loss of power and also excessive oil consumption in some cases. You can get the same symptoms by taking the oil cap off with the engine idling. It will idle terrible and rough. The crankcase vacuum to extract the oil vapor is metered through the PCV valve and the fuel program is calibrated for a certain "leak". Make the leak bigger and it'll be too lean. Any leak AFTER the MAF sensor will also do the same thing. The MAF will "see" one air flow rate but with a leak after the sensor, the engine will actually be getting more air than the ECM thinks it is. The way I'd do it at work is to fix the known problem and then reevaluate if any additional diagnosis or repair is needed. That's how we fix the car without having the customer spend money needlessly. Like it says on our building "Quality Work at a Fair Price". We're always swamped with work, have happy customers and have never had one paid advertisement in the 25 years it's been in business. Yeah, I'm bragging just a bit! lol Side note: I never say I work FOR someone, I say I work WITH them there. Well the repairs went great! Of course my "trusted mechanic" bailed on me so I did everything myself. But I got the helicoils, found the size luckily they had one set left. And every single one took well! I'm no professional but I took my time and did it right and it turned out great. Also the pcv is operating just fine so thanks for saving me a few bucks on that. Just wanted to say I appreciate the advice! I also changed the oil which is quite easy in the a4, and spark plugs and topped the fluids off. I didn't see where to check the transmission fluid though, I may have just completely overlooked it but I didn't see it. And do you know what the intervals are for changing the transmission fluid? I've never done it before but it shouldn't be too difficult right? There is no trans dipstick. The fluid is checked by removing the plug from the bottom of the trans pan, with the engine running. There is no indicator stick. There's a stand tube in the pan so when it's full, the fluid should just barely drip from the hole. To drain the fluid, the stand tube is unscrewed (think it's a 10mm allen???). Basically, if you don't see any leaks and there's no evidence of trans fluid in the coolant (if the cooler leaked), there's really no reason to check it. Technically the service interval is none. They say "filled for life". Still, changing it at maybe 100,000 miles won't hurt anything. If you do, be sure to note Audi automatic trans take special fluid as a general rule, not the typical red ATF. It's mineral oil and is kind of a blue or green color. There's no way to drain the torque converter so you'll only get less than half of the fluid out by draining the pan. To fully change requires a trans flushing machine be hooked to the cooler lines. To be honest, if you've never changed trans fluid in a car before, I wouldn't recommend learning on your Audi. Biggest trouble you'd have is refilling without the special tools. As a side note, when I was an Audi dealer tech, regularly worked on ones with 150,000, 200,000, 250,000 miles that had never had the trans fluid changed and they still worked like new. I'll give Audi one thing, they can build a good auto trans. The CVT's,,,,,,,,,,,,,,,,not so much. Fortunately those only came on front wheel drive (non Quattro) models which up here (central Wisconsin) make up about .02% of all Audi's in the area. Am I getting screwed at The Mechanic? New to Forums - 2012 S4 Bad Cat?